As the table grape season in Chile starts up, a defect to keep an eye out for is sulphur dioxide injury. I wouldn’t say it is a common defect, but you will come across it every now and then. 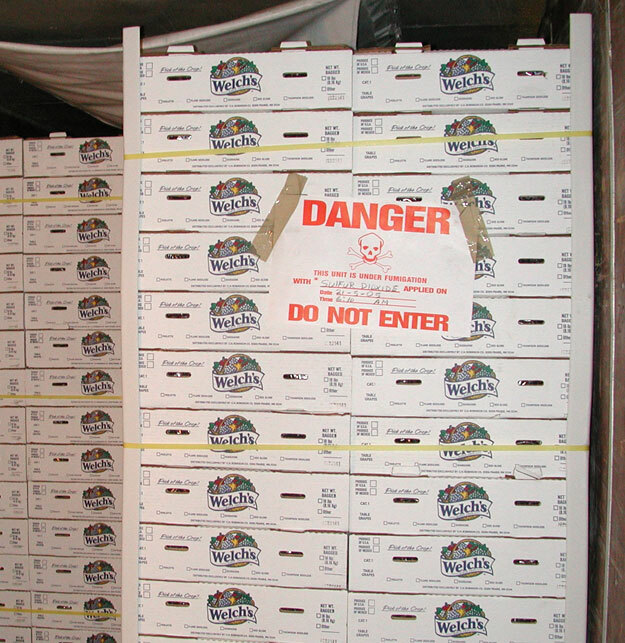 When packed, the grapes are subjected to sulphur dioxide, to act as a fungicide, to control the presence of mold, mostly blue mold rot (pennicillium) and gray mold rot (botrytis). The sulphur dioxide is applied as a gas or as a pad, placed in the individual grape cartons, during packing. Unfortunately, sometimes damage to the berries does occur. Even though the defect is only affecting the color, the berries are scored as sulphur dioxide injury, against the total lot tolerance for defects, 12% (Do not score this defect against the color tolerance). This defect will progress (condition defect) and the affected area will be become soft and sometimes wrinkled. In this stage, the defect would be scored as sulphur dioxide injury, but as serious damage, against the 4% tolerance for serious damage. Tom – perfect timing with the Sulphur Dioxide photos as we have just begun to see this defect on the market. is the sulphur dioxide (in any way) harmful to humans who eat these grapes? what if i ate a whole load of grapes… can the excessive Sulphur Dioxide be harmful to me? The Center for Science in the Public Interest lists the two food preservatives, sulfur dioxide and sodium bisulfite, as being safe for human consumption except for certain individuals who may be sensitive to it, especially in large amounts. 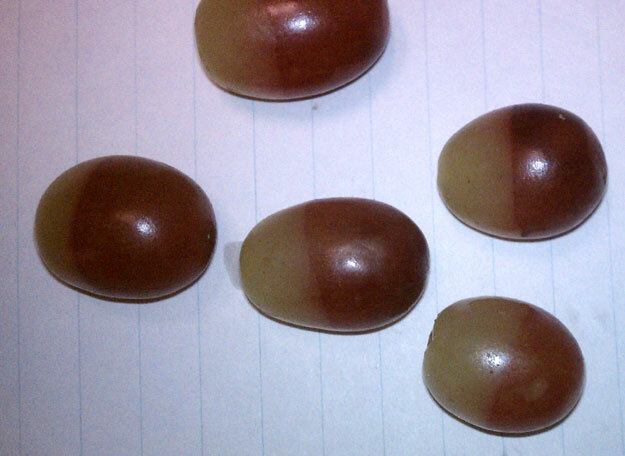 I would assume the grapes themselves have very little sulphur dioxide residue, as compared to the pad itself. Sulphur dioxide has not previously been reported to cause exacerbations of asthma when ingested as a food preservative. It is used as a preservative in a wide range of acidic beverages and foods, and should be considered as possibly causal in patients suffering from apparently cryptogenic asthma, and asthma seemingly due to food allergy. If anyone has additional information please comment. sulphur dioxide in grapes could be safer then eating grapes without any treatment.give you example what happen to me some 30 years ago.i used to grow figs in my garden five different varietes.no spry no chemical as natural as they come.are you ready for a shock these figs nearly killed me.it took me few years to wake up.every year when figs were in season as i get up in the morning i will have head spinning diarhoea and vomiting in same time.i thought im going to die.figs grown in humid areas do split and develop dangerous fungi,you can see them on dried figs,white fungi what people call sugar.yes fruits are dangerous especialy one outside of season,they go mouldy.we inhale fungi with every breath we take,without sulfite maybe life would be imposible,on this fungal planet.cancer is a fungi too. Really good article, very useful! I have a severe reaction to sulphur dioxide on dried fruit- I have had my throat swell and close and coughed all day after eating only a few white peaches dried with sulphur dioxide. I have always felt slightly sick when I ate fresh grapes as well, but I didn’t know why. After recently finding out that there is sulphur dioxide on them too, now I know why. They should be legally required to disclose whatever they have put on our food, because some of us are severely allergic to some of these things. When my throat started swelling closed form it, I was afraid I was going into anaphylactic shock. Without any information disclosure on loose produce, the government is allowing people to be exposed to things which may be harmful for them. It completely disgusts me. By the way, to the other reviewer’s comment about figs, I have been regularly eating dried organic calymyrna figs with no sodium dioxide for years, and I have never once been sick from them. I would rather take my chances with mother nature rather than be subjected against my knowledge (and will) to toxic chemicals all over my food.